The powerful and portable Atlas Copco pumps have been built by skilled technicians, using the highest quality materials and offer an extensive range of dewatering solutions for construction, industrial, emergency and maintenance applications. “The WEDA range of electric submersible dewatering pumps are reliable and robust, featuring a custom-made sealing system and modular design that contribute to them being amongst the most flexible pumps in the business,” says Sarel Bekker, business development manager: portable products, Atlas Copco. He adds that the WEDA+ range has taken all the impressive features of the founding WEDA range and has further improved on them with cutting edge additions. WEDA pumps contain a built-in starter and motor protection system that allows for optional automatic level control. The pumps’ smart modular design includes machined slots that allow for the easy separation of the different parts of each pump. All stainless steel bolts and nuts used within the machine are the same size, therefore making it possible to use one effective tool to complete the entire operation. Other standard components include a reinforced cable entry, built-in run capacitor/contactor, an adjustable discharge connection of 90° or 180°, Class F insulated stators with thermo switches in all windings as well as external plug for grease filling. 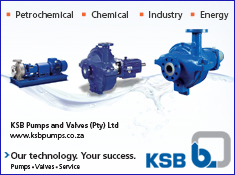 Manufactured to deliver optimum performance in the harshest conditions, these pumps have adjustable wear resistant nitrile rubber diffusors and hardened high quality clog-free chrome impellers. 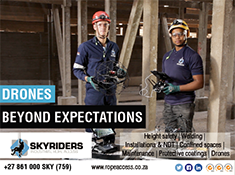 Adding to their durability, the machines’ light weight and compact design allows for easy transportation, installation and storage in confined areas. Featuring a low friction unique sealing system, operators are able to change seals, the impeller and other components within minutes. “Maintenance is simple thanks to the WEDA ISP (Instant Service Pack) that contains the seals, bearing oil and oil housing that can easily be changed onsite,” Bekker adds. Encompassing many features from the successful Atlas Copco WEDA range, the WEDA+ range has taken these features and strengthened them with additions such as the use of improved aluminium alloy with higher corrosion resistance thereby increasing ruggedness and machine lifespan. The advancement of WEDA+ pumps’ cable entry system not only allows for the use of a wider range of cable configurations but also improves sealing. A novel feature across this range is the rotation control and phase failure protection that prevents the risk of the impeller rotating in the wrong direction and, in the case of phase failure, will halt the pump. The economical WEDA+ range features a fuel efficient new motor design with greater efficiency and reduced start current, double row ball bearings with better lifespan as well as new hydraulic ends for boosted productivity and a low lifecycle cost (LCC). The 50+ and 60+ pumps are offered in a normal head (25 and 30µm) and high head (41 and 52 m) respectively with the 60+ also available in a super high head (76 m). The WEDA 50+ features an impressive maximum flow between 1 173 and 2 347 ℓ/min while a maximum flow of between 984 and 2 650 ℓ/min can be achieved with the 60+ pump, depending on the pressure head required. The 50+ only requires a maximum power input of 7.5 kW and has the capability of a shaft speed of 3 460 rpm. Following suit, the 60+ pump needs a maximum power input of 10 kW with a 3 470 rpm shaft speed capacity. Both units have a maximum solid handling size of 8,0 mm. “Atlas Copco is proud of the new Super High Head WEDA 60+ model that is the most compact and lightweight within its class and delivers unrivalled performance combined with easy portability. Both the WEDA 50+ and 60+ dewatering pumps provide customers and end-users with service excellence, a factor that Atlas Copco strives to uphold throughout our comprehensive product and service portfolio,” concludes Bekker. Atlas Copco Power Technique supports its range of electrical, diesel and petrol dewatering pumps with excellent after-sales service further boosted by a countrywide dealer network. With the introduction of the dewatering pump range, Atlas Copco Power Technique added a fourth pillar to its portable energy product offering to bring 360° air, power, light and flow solutions and services to mining and industry across Southern Africa.